The Cathedral of St. Prince Vladimir Equal to the Apostles, (Russian: собор Святого равноапостольного князя Владимира), more commonly known as The Prince Vladimir Cathedral, (Russian: Князь-Владимирский Собор), is the culmination of a series church structures built on the same site in St. Petersburg, Russia during the eighteenth century. The cathedral which is located in the Petrogradsky District of St. Petersburg was completed in 1789. In 1708, a wooden church, dedicated to St. Nicholas, was built on the present site of the Prince Vladimir Church, an area that is often flooded when the Neva River overflows its banks. This building was soon replaced by a structure of varying descriptions, "stone" and "daub and wattle", in 1719, dedicated to the Dormition (Assumption) of the Theotokos while a stone cathedral was planned under orders of Empress Anna Ioannovna. In the meantime, in 1740, construction of a stone church, designed by Pietro Trezzini, began next to the Church of the Assumption under an order of Empress Anna of Russia. This church, however, was left incomplete, with the bulk of the work on the construction of the church left in the rough, when Empress Elizabeth of Russia came to the throne in 1742. The project was renewed after the ascension of Empress Elizabeth to the throne of Russia with construction now under the supervision by the architect Antonio Rinaldi in 1765/1766. Under the original plan to name the new Cathedral after the Dormition of the Mother of God, Rinaldi was instructed to follow the design of the Dormition Cathedral in the Kremlin. However, a major fire on March 12, 1772 severely damaged the the half-completed building and it was eleven years before work resumed on its construction. The church was finally completed in 1789 to the Neoclassical designs of Ivan Egorovich Starov. As the completion of the cathedral coincided with the unification of Russia and the Crimean Khanate, the event probably led to the dedication of the Cathedral to St. Vladimir Equal-to-the-Apostles, the Kievan Prince who brought Christianity to Russia in 988 AD. During the Soviet years the Cathedral of Prince Vladimir survived with little alteration although much of the interior decoration was removed after the Revolution. The cathedral was closed formally only in 1926 and 1927. Otherwise, the cathedral continued to function, even through the worst years of the Siege of Leningrad. 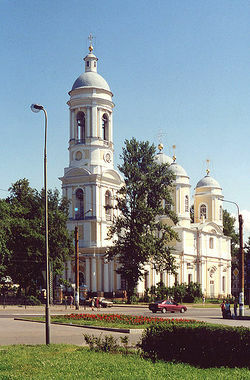 From 1938 to 1941, the Cathedral of Prince Vladimir served as the seat of the Eparchy of the city. The building became a sanctuary for some of the most important religious treasures of St. Petersburg, including the Kazan Icon of the Mother of God from 1941 to 2001 when it was returned to the Kazan Cathedral. The style of the cathedral features a transition from baroque to classicism, such as use of arched gables. The building is 57 meters high with five domes and a the bell tower. Its interior is simple, without wall paintings with only four images of the four Evangelists and copies of paintings by Raphael. The iconostasis is made of carved wood in the "Empire" style. This page was last edited on April 28, 2013, at 01:21.